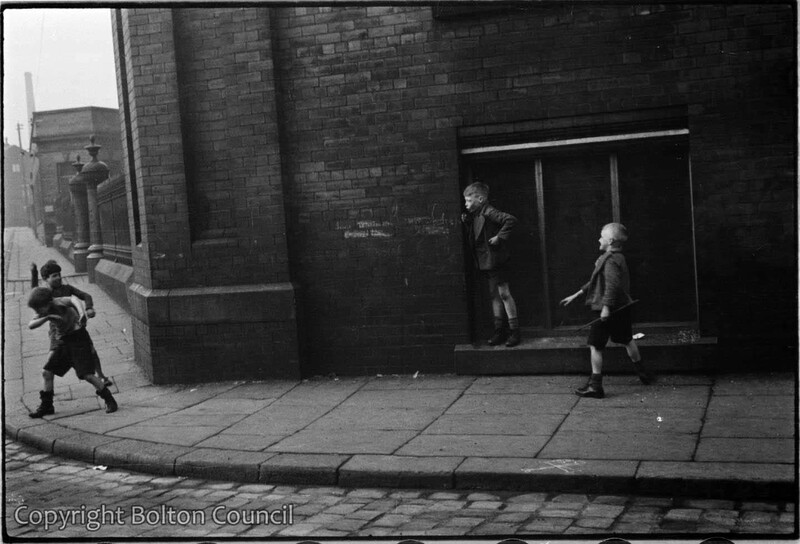 Children play street games alongside Union Mill at the junction of Davenport St, Snowden St and Arrow St. The boy on the ledge is Bob Harwood, to his right is his friend Billy Doig. The children were identified by Bob Harwood’s nephew, Norman King. We are lending some of our Spender photographs to the Tate Gallery in Liverpool. They are looking to run some news stories based on people in the Spender photographs. We wondered if you might be willing to get involved. If yes, could you send me your email address and phone number? Isn’t that the corner of Snowden Street and Arrow Street, by Union Mill? The chimney would be at Nelson Mill on Gaskell Street.